Atlanta Mayor Kasim Reed’s “Power to Change” sustainability initiative targets bringing local food within 10 minutes of 75 percent of all residents by 2020. However, it takes more than 10 minutes from the capitol building to find the nearest several-hundred-acre farming operation, where most of our local fruits and vegetables come from. Atlanta is simply too sprawled to accommodate farming on that scale. Instead, micro operations in front yards, abandoned lots, unused roadsides, and even rooftops have become ripe for urban agriculture. It has been widely accepted around Atlanta for years, with many community gardens and urban farms revitalizing forgotten or undeveloped spaces inside the perimeter. However, this has not come without its challenges from conflicts with existing law and undefined policies for how and where food can be grown in an urban environment. 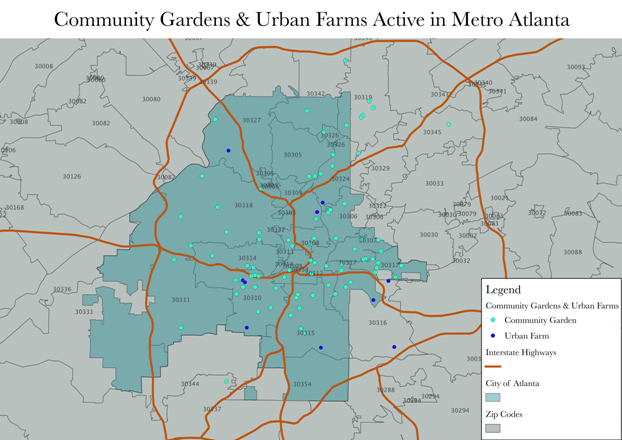 Before June 2014, Atlanta’s zoning laws impeded urban agriculture developments in several major ways. 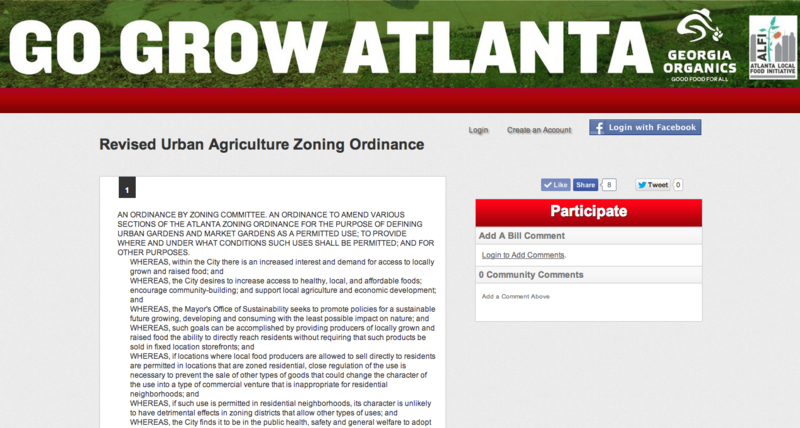 This prompted a group of urban farmers, community gardeners, health professionals, and community development organizations to develop a legislative proposal to amend Atlanta’s zoning law. Since this ordinance was the first of its kind in Atlanta, they sought collaboration with the public at large. In addition to discussions at NPU meetings and online publicity, citizens should be able to access and collaborate on the real language of the ordinance. I worked with Amanda Meng and Carl DiSalvo at Georgia Tech to implement a platform that enables citizens with that access and collaboration. That platform was based on The Madison Project by the OpenGov Foundation that hosts public documents, breaks it down into sections, and allows its users to comment on those sections. This allowed citizens’ important questions about the ordinance’s language to be answered by the ordinance’s key proponents more quickly and directly than the meetings or website alone. This was largely Meng’s project, with DiSalvo’s guidance, and they requested my help in implementing and advising on this technical solution. I also attended an NPU meeting and worked with the Atlanta Local Food Initiative (ALFI) and Georgia Organics to support and collaborate on the platform itself, generating much interest and feedback.